This hilarious canine guru will lift your spirits and bring a smile to your face. The "Doggy Lama" dispenses Zenlike wisdom in her inimitable bulldog style. With a face everyone can love, a bikini-clad Zelda reminds us that appearances count for nothing. "You are a soul with a body...not a body with a soul." Who knew that true Zen wisdom could be found in the form of a 60-pound bulldog? Zelda reminds us that "laughing at ourselves brings us closer to enlightenment than anything else." We would all do well to get in touch with our inner Zelda. Zelda is back. 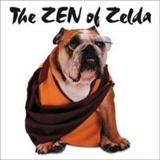 In the follow-up to her hilarious debut, Zelda Wisdom, Zelda returns to lead us down the doggy path to enlightenment with zany Zen koans and more of the laugh-inducing photographs that made her first book such a hit. This hilarious canine guru will lift your spirits and bring a smile to your face. The "Doggy Lama" dispenses Zenlike wisdom in her inimitable bulldog style. With a face everyone can love, a bikini-clad Zelda reminds us that appearances count for nothing. "You are a soul with a body. . . not a body with a soul." Who knew that true Zen wisdom could be found in the form of a 60-pound bulldog? Zelda reminds us that "laughing at ourselves brings us closer to enlightenment than anything else." We would all do well to get in touch with our inner Zelda.